If a buzzer operates from a low enough voltage and draws low enough current, it can be interfaced directly to an Arduino Uno pin. The buzzer used in this example can operate from a voltage between 3 to 28V and draws only 4mA of current at 12V. When the current drawn by the buzzer was measured at 5V, it was found that it only drew about 1.1mA which is well within the drive capability of an Arduino Uno pin. See the Arduino buzzer circuit if you want to connect a buzzer to the Arduino that operates from a different voltage to the Arduino or if you are using a buzzer that draws more current than an Arduino pin can deliver. 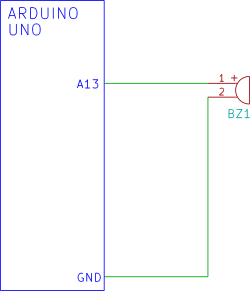 In this circuit, the positive lead of the buzzer is connected to pin 13 of the Arduino, the negative lead of the buzzer is connected to GND. The Blink sketch will switch the buzzer on and off continuously. The buzzer used in this article has the part number KPEG260 and the RS Components stock number: 535-8275, the brand is Kingstate. This is a piezo buzzer that has built in circuitry that produces the audible buzzer tone. A plain piezo disk will not work in this circuit as it does not have any circuitry to drive it, although an Arduino sketch could be written to drive a piezo disk that is connected to an Arduino pin.